M. Le Brun, Paris, his sale, Hôtel Drouot, Paris, 23 February 1918, lot 4 (illustrated). Possibly acquired at the above sale by the family of the present owner or shortly after, and thence by descent to the present owner. R. Schmit, Eugène Boudin. 1824-1898, vol. III, Paris, 1973, no. 2655 (illustrated p. 38). Paris, Salon de la Société nationale des Beaux Arts, May - June 1890, no. 116, p. 31 (titled La plage de Bénerville). Paris, Galerie Hector Brame, Eugène Boudin, Peintures - Pastels - Acquarelles, November - December 1956, no. 1. Paris, Galerie Charpentier, Trésors du Musée de Caen et Boudin, June - September 1958, no. 25. Bénerville. La plage is the most impressive large scale beachscape recorded in Robert Schmit's Boudin catalogue raisonné for the year 1890. Only one other canvas (S.2727) is comparable in scale (and depicts the cliffs at Etretat). Both works were exhibited at the Salon and this may partly explain their ambitious scale and execution. Beerville, La plage shows Boudin confidently deploying his great skill in capturing the wonders of light, air and water. Boudin devotes two thirds of the composition to the large expanse of sky, across which huge white clouds roll impressively, the mastery of which reaffirm Corot's description of Boudin as "the king of the skies". A thin silvery band of sea to the left marks the distant horizon, peppered with yachts and steamships. The empty sandy foreground invites us to join the groups of figures in the middle distance, walking towards the dramatically lit headland. The same view, though on a much more modest scale, hangs in the Graves Art Gallery, Sheffield. Though smaller the Sheffield picture is compositionally similar. 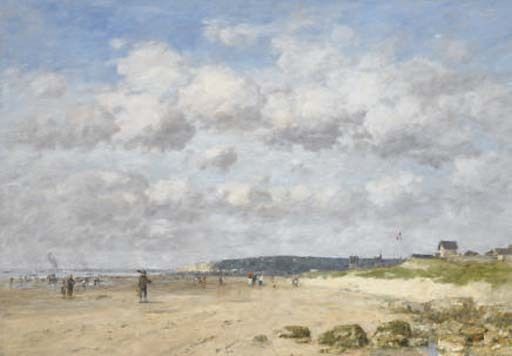 However, in the present work Boudin has added the flag pole and tricolour to the dunes on the right, indicating to us, like the smoke from the steamships out to sea, the direction in which the wind is blowing, completing Bénerville, La plage, as a feast for the senses. According to the present owners Bénerville. La plage was probably purchased at the sale of M. Le Brun, on 23 February 1918, or shortly after and has therefore remained in the same family collection for almost 90 years. It was last publicly exhibited in 1958.